The University of Exeter's lead exoplanet modeller, Dr. Nathan Mayne, in remarks to Wired, said, "If, and it is a huge if, the composition of the atmosphere was Earth-like then we showed the planet could indeed support temperatures which would allow liquid water on the surface". In another statement, he emphasized researchers could also "exploit this to hopefully improve our understanding of how our own climate has and will evolve". 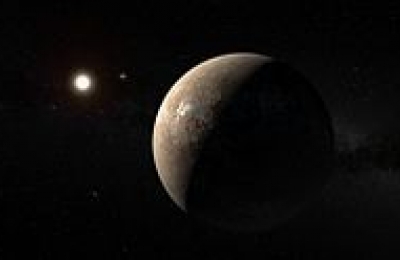 Proxima B is believed roughly Earth-sized and in its solar system's habitable zone, meaning it would have similar gravity to Earth and at least the possibility of liquid water. The exoplanet was discovered in August 2016 about 4.2 light years from Earth. Last year, NASA put out a statement expressing doubt that the planet could have an atmosphere in the sense that most of us understand it: "Considering the host star's age and the planet's proximity to its host star, the scientists expect that Proxima B is subjected to torrents of X-ray and extreme ultraviolet radiation from superflares occurring roughly every two hours." Co-author Dr. James Manners said, "One of the main features that distinguishes this planet from Earth is that the light from its star is mostly in the near infra-red[...] These frequencies of light interact much more strongly with water vapour and carbon dioxide in the atmosphere which affects the climate that emerges in our model." This new model allowed scientists to evaluate the effects of Proxima B's possible orbits and likely exposure to radiation and solar flares from its red dwarf sun on two types of atmospheres. The specifics of Proxima B's orbit are not yet established. It might rotate around its axis quickly the way Earth does or it might be tidally locked to its sun, with one side of the planet always lit and the other always dark. It might have a near-circular orbit or an elliptical one. All these variations would have different effects on the flow of any gases over its surface. The models described in this paper review two possible orbits: one tidally locked and one modeled after Mercury's, with a slow-rotating three days per year. The team used the Met Office Unified Model to produce the simulations.